The April Fools' 6th Anniversary Dinner was simply a blast. Members and their families enjoyed a tasty dinner provided by Rosso's Pizzeria and Costeaux Bakery. 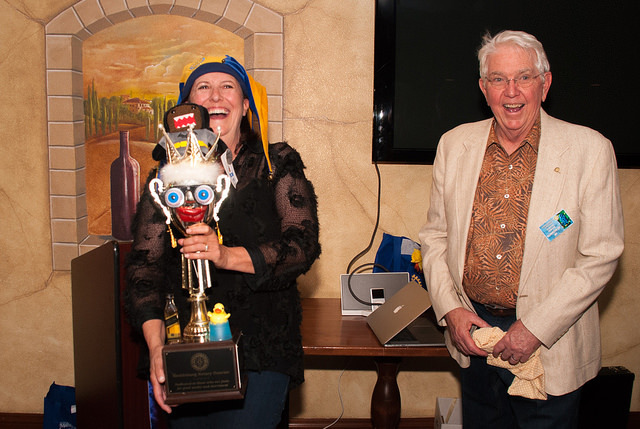 Highlights of the evening included a recap of our many accomplishments, induction of Colleen Householder, our 51st member, the Hat Presentation to Ed Smith, Paul Harris Presentations, and of course, the coveted Fool's Cup Award. President Pam presided along with special guests, PDGs Ken Moulton, Helaine Campbell, and Bruce Campbell. Excellent photos by our own Doug Pile can be seen in slideshow form under Photo Albums in the Bulletin or on the Home Page of our website. A special thanks goes to Dan Erikson, his committee, and their families for lending a hand. Initiated by Nancy Palumbo, The Fool's Cup has come to honor the most spirited new member of the year. This year the Cup was passed from Jay Beckwith to Diane Bucher. Diane has thrown herself into the club's activities with dedication and an enormous capacity for fun, demonstrated here by her great smile. 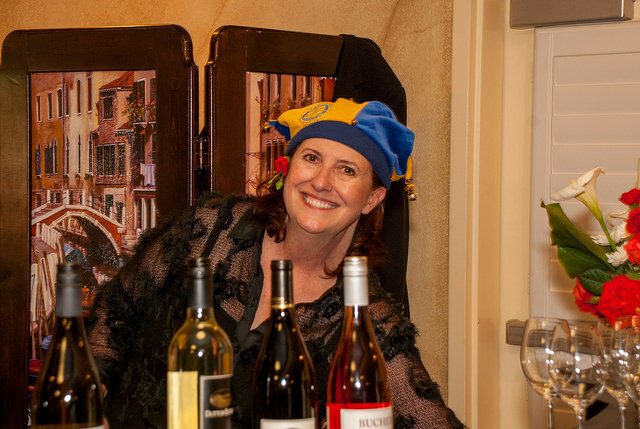 Diane must display the Fool's Cup for one year in her office and at the end of that year, add a little something that signifies her Jester experience. Past winners are: Susan Jones, Greg Marguglio, David Wasley, and Jay Beckwith.